UPDATE: SAS Watch will be Omega Planet Ocean – I Already Have a Watch. Here’s a new wrinkle unfolding: perhaps in a spirit of one-upmanship between the two competitive units, apparently the new UK Special Air Service (SAS) Omega watch is to be an Omega Planet Ocean, not the GMT used by the Special Boat Service. Exactly which size/model is not yet known. This neatly answers questions raised by some collectors as to why the GMT had been chosen (again) in favor of the Planet Ocean. The PO seemed to many to be the more logical choice, with its more tactical black color scheme and its presence as Omega’s latest and top-of-the-line dive watch with a water resistance rating twice that of the GMT. Though one one hand it might seem that the GMT function could prove useful in military and tactical employment, once again these are likely to mostly be worn off duty and in camp and not by the Special Air Service during training, so it becomes somewhat immaterial. And again these are privately purchased commemoratives and not SAS-issue equipment. 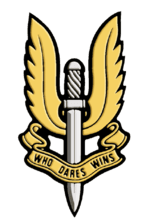 Reportedly the SAS PO LE will also feature a custom slogan inscription – one other than the official “Who Dares Wins.” With the GMT this was easily accomplished with the inside-printed sapphire back. However, as the Planet Ocean doesn’t have a display back already, it’s conceivable that a more traditional metal display back might be used for the custom engraving, perhaps like the military X-33 versions. Tagged with Military Watches, Omega Watches, sas, sbs.